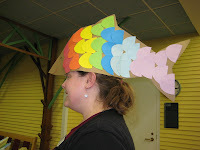 Abby the Librarian: Fish hats! Wednesday marked the beginning of another session of our After School Adventures program. ASA runs for six weeks on Wednesday afternoons and we do a session in the spring and a session in the fall. It's for kids in Kindergarten through 4th grade (although the past two sessions have been almost exclusively Kingergarteners and 1st graders), and it's one of my favorite programs. We kicked things off this session by making our nametags, saying hello to the kids returning from last session (yay!) and getting to know the new kids. Then we proceeded with the memory box (which I just now realized that we forgot to return to at the end of the program... oh well...). The memory box is a colorfully decoupaged shoebox that we use with all our registered storytimes for 3's and up. Each week we find an object that occurs somewhere in one of the books. We shake the box around, letting them hear what the object sounds like and then let them guess what it might be. Once they've guessed (usually with a hint from one of us), we show them the object and tell them to look for it in the stories. Each week we keep the previously objects in the box and add one new object. And each week before we read the stories, we bring out the memory box and see who can remember what was in it and which story it was from. This week's object was a plastic octopus because our theme for ASA was ocean creatures. We read Ugly Fish and I'm the Biggest Thing in the Ocean (which has an octopus in it). And then we made... fish hats! We had some wonderful volunteers who cut out all the pieces for us, so everything was already prepared and all the kids had to do was glue on the scales and decorate it however they wanted. Besides the scales, we also put out markers. You could use whatever other decorating things you wanted to (crayons, magazine pictures, wrapping paper, sequins, beads, glitter [if you're brave]). And if you've got everything prepared so that all they have to do is glue and decorate, I see no reason why preschoolers wouldn't be able to do this craft, too. What we didn't realize was that we had picked two short books for storytime and that some of the kids would finish this craft in ten minutes. Luckily, when we pulled browsing books, we had pulled a copy of Swimmy and my coworker B collected the kids who were done with the craft and did an impromptu reading. The kids were absolutely adorable with their little fish hats and we got some great pictures of them. It was a great kickoff to our session and I'm already looking forward to next week!